Police in Grand Bahama are investigating a shooting incident that has left a male in critical condition at the Rand Memorial Hospital. Police in Grand Bahama are investigating a traffic accident that has left a male dead. Reports are that on Tuesday 26th March 2019, shortly after 3:00pm, officers of the Northeastern Division executed a search warrant at a residence on Bering Lane, where they discovered a quantity of suspected marijuana and (6) potted marijuana plants. Natoris Deano Taylor age 23 years, Kivan Keyano Wilkinson age 20 years, Kyle Jamaal Forbes age 20 years and a 17 year old juvenile, all of Pioneers Loop, Grand Bahama, were arraigned before Deputy Chief Magistrate Debbye Ferguson in Magistrate Court #1 on Murder charge. They were not required to enter a plea and the matter was adjourned to June 20th 2019 for a Preliminary Trial. Reports are that on Sunday 24th March 2019 shortly after 6:00pm, officers of the Flying Squad while on patrol in the Eight Mile Rock area and acting on information, proceeded to a dirt road, off Praise the Lord Corner in Eight Mile Rock, where they discovered in an abandoned structure, a white crocus sack that contained 5lbs. of suspected marijuana. Reports are that on Friday 22nd March 2019, shortly after 2:00pm, officers of the Flying Squad in Grand Bahama, acting on information, proceeded to Grays Avenue, Seagrape, Eight Mile Rock, where they uncovered in bushes, (5) plastic bags containing 12 lbs. of suspected marijuana, with a street value of $12,000.00 and a silver and black pistol containing (4) hollowed tip .380 ammunition. The Grand Bahama Port Authority, Limited wishes to advise the public that as Regulators, we were notified by The Grand Bahama Power Company (GBPC) that during a course of their recent meter audit, they discovered a number of suspected electricity diversions at several businesses within the Port Area. As a result, we immediately began our own independent investigations into this matter which is currently ongoing. Thus far, we can confirm that all of the work performed by the licensee was unpermitted, and was executed outside the scope of the license. Reports are that between 1pm and 4pm on Monday 4th March 2019, officers of the Central Division launched operation “Mid-Day Pickup” that focused on the down town area, where they arrested a number of persons for vagrancy and outstanding warrants. 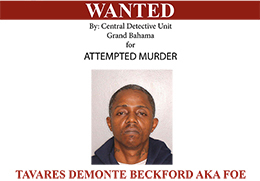 Police in Grand Bahama are investigating an armed robbery that occurred on Wednesday 27th February 2019. Reports are that shortly before 9:00pm, a male culprit entered a business establishment in Martin Town, Eight Mile Rock, armed with a firearm and robbed the establishment of cash before making good his escape. Reports are that on Wednesday 27th February 2019 shortly after 3:00pm, Police Fire Services assisted by the Grand Bahama Airport Fire Services, were called to Rachel’s Britannia Mini Mall in the Caravel Beach area, where they met the multi business complex engulfed in flames. The structure is value at $800,000.00 and arson is suspected in this matter. Reports are that on Tuesday 19th February 2019, Drug Enforcement Unit Officers acting on intelligence, proceeded to an area in Martin Town, Eight Mile Rock, where they discovered in the bush, a 9mm pistol with (9) rounds of ammunition. There were no arrest made in this matter. Investigation will continue. Police in Grand Bahama are investigating a stabbing incident that has left three males with injuries. Officers of the North Eastern Police Station on Tuesday 12th February 2019, while on mobile patrol in the area of Weddell Avenue in the vicinity Garden Villas, arrested a 27 year old male of Hearne Lane and a 45 year old male of Balao Loop who were found in possession of (63) packages of suspected marijuana.